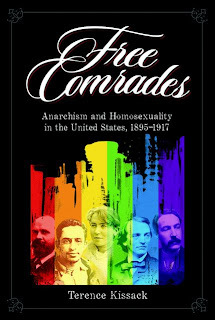 Terence Kissack will be presenting his new book, Free Comrades, at the GLBTHS on Wednesday, July 30th from 6 to 7:30 p.m. The event is free and open to the public. Light refreshments will be served. In his book, Kissack examines the trial and imprisonment of Oscar Wilde, the life and work of Walt Whitman, periodicals including Tucker's Liberty and Leonard Abbott's The Free Comrade, and the frank treatment of homosexual relations in Berkman's Prison Memoirs of an Anarchist. Terence Kissack is a former Executive Director of San Francisco's Gay, Lesbian, Bisexual, Transgender Historical Society, and he currently serves on the board. His writings have appeared in Radical History Review and Journal of the History of Sexuality.